Mr. Craver is the retired chairman, president, and CEO of Edison International, an electric utility holding company located in Rosemead, California. He served as chairman, president and CEO of Edison International from 2008 to 2016 and as chairman and CEO of Edison Mission Energy, a subsidiary of Edison, from 2005 to 2008. He joined Edison in 1996 and held other senior management positions, including executive vice president, chief financial officer and treasurer. Before joining Edison, Craver served as executive vice president and corporate treasurer of First Interstate Bancorp, a Wells Fargo predecessor company, and executive vice president and chief financial officer of First Interstate’s wholesale banking subsidiary. Craver is a member of the board of directors and chairman of the audit committee of Duke Energy Corporation, senior advisor to the Blackstone Group, and senior advisor to Bain & Company. He also serves on the Federal Reserve Bank of San Francisco’s Economic Advisory Council. 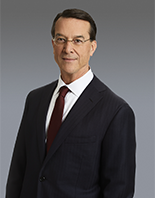 Mr. Craver is vice chairman of the board of trustees of the Autry Museum of the American West, a member of the advisory board of the Smithsonian National Museum of American History, and a board member of the Western Los Angeles County Council of the Boy Scouts of America. He received his Bachelor of Arts and Master of Business Administration degrees from the University of Southern California.